There can be many problems when your teeth don’t sit perfectly. For example, your teeth may not meet correctly when you bite, which can cause them to wear prematurely and may give you pain in your jaw. Good oral hygiene can also be a challenge when teeth are overlapping, as you can’t get your brush into the areas where plaque or decay might start. Orthodontics (teeth straightening solutions) are the effective way to straighten crooked or misaligned teeth and improve appearance and dental health while restoring your confidence in your smile. We offer a range of teeth straightening solutions for both adults and children. There are three key types of orthodontics to choose from. Kostas Spathoulas is our specialist in orthodontics, can straighten most children’s and adults’ teeth with a range of conventional (customised) orthodontic treatments. Anterior Alignment orthodontics, such as Cfast braces, quickly straighten most adults' front teeth in as little as six months! Cathleen Perrin is a dentist at Elmsleigh House Dental Clinic, Farnham, who offers a free consultation to adults to determine if these faster brace systems would be suitable. Invisalign treatment involves a series of clear removable aligner that can fix issues such as overcrowded teeth, widely spaced teeth, crossbites, overbites and underbites. Using advanced three-dimensional computer-imaging technology, a series of clear aligners are custom made to fit precisely over your teeth. Each aligner is worn for up to two weeks before being replaced by the next in the series, gradually moving your teeth towards the projected final position; the average treatment time for adults is between 6–18 months. Unlike traditional fixed braces there are no metal brackets or wires, and aligners can be removed for eating and cleaning your teeth. 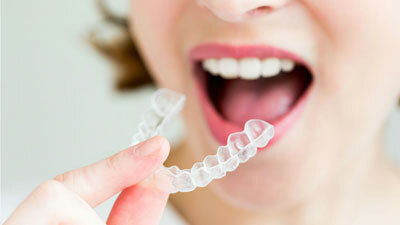 To learn more about Invisalign, please click below to read our blog.